With grateful thanks to the Asphar family , and especially Charles’s sons Charles and Philip and nieces Anne and Helen , for giving permission to post these fascinating letters from WW1 here. New transcription and corrections by Marilyn and Peter Agius (grandson of Joseph Agius and Maggie Samut). Charles Herman Asphar was born in Sliema, Malta, 1 December 1895. 4th child of seven to John Francis Asphar and Mary Vella. The Asphar family lived at ‘Rocklands’, 1 Windsor Terrace, Sliema , on a corner of Tower Road (Fond Ghadir) where many of their close friends resided – the Samut, Muscat, Parnis, Mortimer and Camillieri families in particular. The Agius family in Hampstead, London, was well known to all these families in Malta. 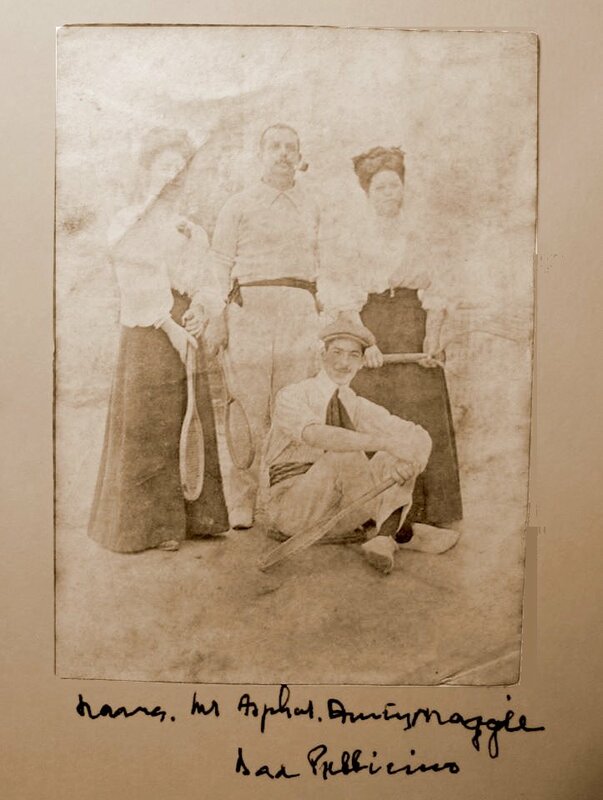 Edward T Agius had started in business in London in 1869 , married Maria Concetta Muscat in Valletta in 1873, and produced 15 children in Hampstead by 1896. The family home, 3 Belsize Grove , was open house to any Maltese visiting London especially on Sunday afternoons. By 1914, three of Edward’s daughters had married Maltese and settled on Tower Road, Sliema – Inez married to Salvatore Cassar , Marie married to Frank Denaro and Mabel married to Anthony Arrigo. In 1909 , his son Joseph married Maggie Samut at St Patrick’s Sliema and took her back to 22 Downside Crescent , Hampstead, near to Belsize Grove. And so it was that when Charles was in London in 1917 he was more than welcome at No 3 , and well known to Maggie (Samut) Agius and also the last unmarried daughter , Daisy Agius. Charles was born into a large family , in which his father and siblings had been raised with their 1st cousins including Dom Maurus Caruana. Maurus (baptised Louis) had been at school at Fort Augustus in Scotland and then joined the monastery there. In 1905 he was briefly secretary to Archbishop Ambrose Agius (Ed T Agius’s brother), when he was Apostolic Delegate in Manila, and in 1915 became Bishop of Malta. Charles refers to him as ‘Bish’ in his letters and clearly knew his ‘uncle’ very well. In November 1916 Charles was in the OTC (Officer Training Corps) in England looking to get a commission in the British Army. 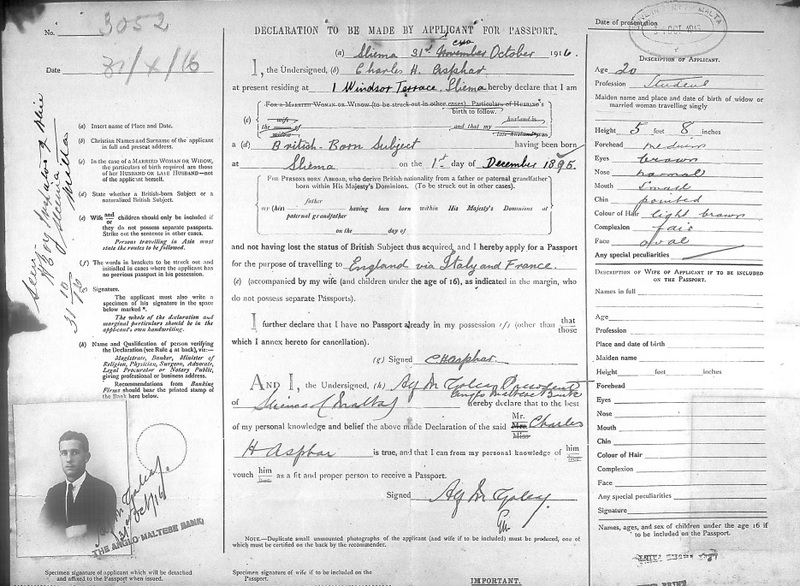 In his first letter home he not only mentions his close relations back home but also all the Maltese friends that he had been meeting in London – Daisy and Richard Agius, Frank & Arthur Samut and Oscar Parnis. In August 1917 he received his commission and became Lt C H Asphar of 12th Machine Gun Company, and ready to be sent to the Western Front. In September he wrote his first letter from the trenches and not much later , 9th October, he received a minor wound that he described in his letter of the 11th October. Invalided back to London, he was looked after by the Agius family and was one of the first outside the Agius family to hear of his friend Richard Agius being killed in action at Poelcapelle (Battle of Passchendaele) on 26th October. In his letter home of 14th November, Charles describes the day he was wounded and how it was near Poelcapelle , not far from where Richard Agius fell just two weeks later. 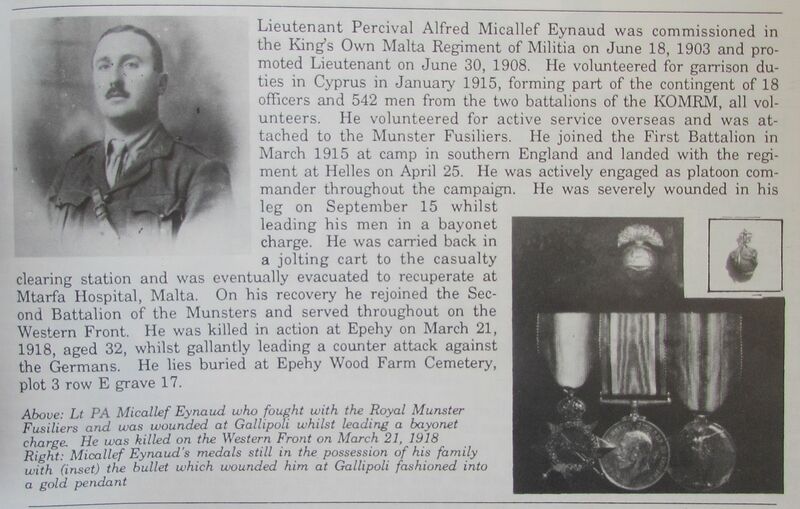 After a period of convalescence, Charles was at various camps in England and was in Northumberland when he heard news of the death of another great friend ‘PA’ (Lt Percy Alfred Micallef-Eynaud) on 18th March 1918 – the first day of Germany’s Spring Offensive. In August 1918 Charles was posted back to the Western Front in 4th MCG to be involved in the Allies’ 100 day push to victory. The final days leading up to the Armistice are described in a blog on this website. In these days Charles found himself very near his old friends Arthur Samut, Willie Parnis and Charles Muscat. His final letter is written in September 1919 at the Machine Gun School – British Army of the Rhine. On leaving the army Charles returned to Malta. A passenger record in January 1922 shows him arriving from the Gold Coast (as Assistant D.C.) and staying at 3 Belsize Grove , where Ed T Agius, Maria Concetta, Alfred and Daisy were still in residence. He later emigrated to Australia where his descendants now reside. Charles died in Glendalough, Perth, Western Australia in 1986 , aged 91. The Asphar family of Rocklands, 1 Windsor Terrace, Sliema. The Bonavia sisters, Angelica and Elizabeth, died young and so when John Asphar married Philomena Caruana (Sister-in-law of Elizabeth) he agreed to raise the two families together. 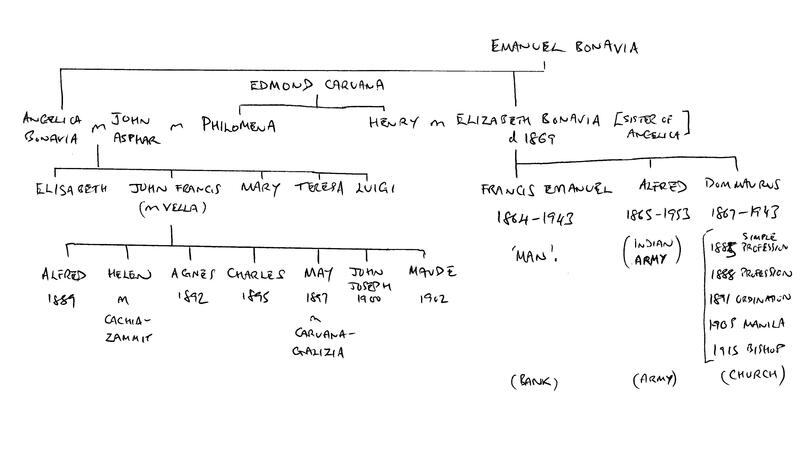 And so it was that Charles grew up knowing his Caruana ‘uncles’ very well (actually his father’s 1st cousins). When Charles joined the army he gave Francis Emanuel, a banker in London, as his next of kin and refers to him as ‘Man’ in his letters. He also refers to Bishop Caruana as ‘Bish’. Capt William Parnis MC b 1893 . 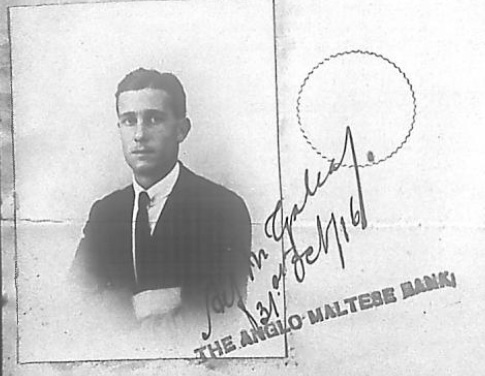 Lived in London but died in Valletta in 28 Feb 1942.